The trailer of Salman Khan starrer Bharat is going to be out on 24th April and just before one week of the trailer, Salman Khan shared his look from the film. 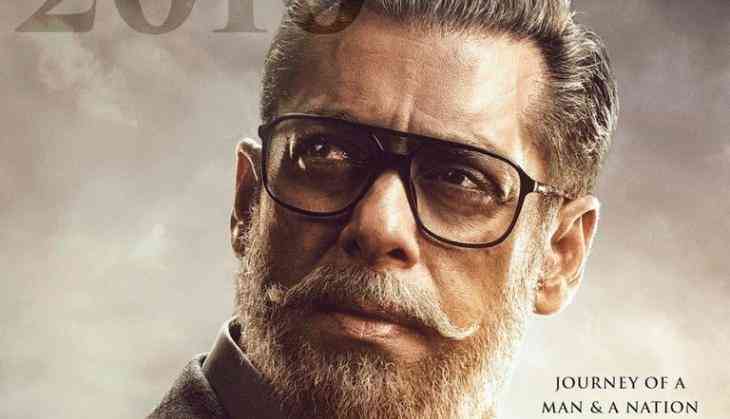 Today morning, Salman Khan shared the poster of the film Bharat, in which he is looking aged and the look was set in the year 2010. While sharing the poster on social media, Salman Khan tweeted, "Jitne safed baal mere sar aur dhaadi mein hain, usse kahin zyada rangeen meri zindagi rahi hain! #Bharat" (The much hair and beard is which, the life has been much colourful though). Let us tell you that Bharat has directed by Ali Abbas Zafar who has made films like Sultan and Tiger Zinda Hai with Salman Khan. Even in Tiger Zinda Hai, he had both Salman Khan and Katrina Kaif in the leading roles. Once again Salman and Katrina are sharing the screen in Bharat. The film has made under the banner of Salman Khan's brother-in-law Atul Agnihotri who also made Bodyguard with Salman. Talking about the film, it stars Salman Khan, Katrina Kaif, Jackie Shroff, Tabu, Disha Patani, Sunil Grover in the leading roles. While Varun Dhawan has done a cameo in the film. Bharat is going to release on Eid 2019 i.e 5th June 2019. Also Read - Ranbir Kapoor or Hrithik Roshan may star in Raj Kumar Gupta's next, biopic on Indian spy Ravindra Kaushik?